Recently, while getting Herb's eyeglasses repaired at a local mall, we struck up a conversation with the young man assisting in the repair. He had noticed our T-shirts, adorned with Boxers, of course, and inquired whether we had Boxers. We advised him we did and he proceeded to ask me to describe what I liked about Boxers and why I felt the breed was so special. He was intent on getting a dog for the family and had heard Boxers were good with children and usually made good family dogs… Because of the limited amount of time he had to spend with us, I could only give him a brief account of our breed's "special" qualities… After returning home, I decided to put my description of our breed down on paper. I hope it will make a good handout when you talk to others interested in being "owned “by our breed. The Boxer is not a breed to be left in the backyard and excluded from the home. They do not thrive well in extreme weather, be it heat or cold. The Boxer's temperament is designed to live in the house with the family as a member of the family. Warm beds in winter, a cool spot away from the summer’s heat are a basic requirement. A good diet, fresh water, a good health-care program, and regular grooming (compared to other breeds, the Boxer is truly low maintenance in this aspect) will lead the Boxer to repay you his/her keep in ways you could never imagine. Children are especially coveted by the Boxer. I have always believed that the Boxer's child-like spirit is very much like the "small humans" they so adore. Boxers require the exact same portions of love, discipline and freedom to grow to their full potential. Living in a household with children and Boxers is very rewarding. It is also a quest we cannot take carelessly. Remember, both children and Boxers will reflect our failures as well as our triumphs. A Boxer will succeed in a household without children, as long as the "parent" has the ability to dispense those necessary portions of love, discipline and freedom. Therefore, just like some people are never meant to be parents, some people are not meant to be Boxer owners. A prospective Boxer companion should understand and be prepared for this "parenthood." Like children, the Boxer can adapt to any lifestyle as long as the "parent" in his/her life remains loving and dependable. The responsibilities for children and dogs of any breed are the same. Some animal rights' people will probably consider my opinion of our breed foolish. Some believe dogs or other animals do not perceive human emotions of love, hate, fear, happiness, sadness, shame or guilt. Animals are, in some eyes, meant to walk the earth in their natural state devoid of human companionship. We should simply admire them from a distance. Obviously, they have never lived with a Boxer. One only has to look into the eyes of the Boxer, the mirror of their soul, to know they feel and exhibit all our human emotions. Boxers, like children, know how to use all of them to their own advantage. I have lived with other breeds in my 50-plus years; the last 29 years I have spent exclusively with Boxers. The Boxer is, by far, my favorite. Sporting dogs, hounds, herding dogs, terriers and other dogs have shared my life from time to time -- none have strengthened my life like the Boxer. Their uncanny ability to adjust to whatever life sends their way has been my deliverance on many occasions. They can find humor when there is no laughter. They can see heartbreak and offer comfort even when there are no tears. They can sense danger and react with amazing calm. There are times when we must face our fears; Boxers are fearless when they know they are loved and they trust those who love them. The surest way to break a Boxer's heart is to break that trust. Only when there is no trust do they allow their fear to show. Take a good look into the eyes of a Boxer coming through a rescue program if you get the chance, you will know immediately what I mean. 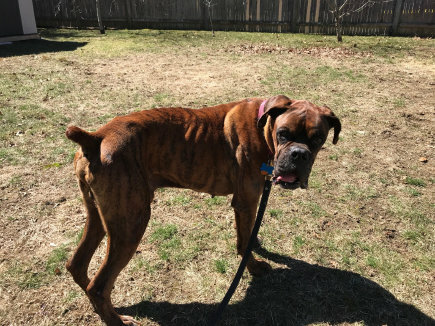 The character of the Boxer that sets them apart from other breeds in their ability to forgive the most insufferable treatment; they are always willing to give humans a second chance to renew their trust in us. You do not gain this position or respect that comes with it by force. You gain the Boxer's respect with a firm but thoughtful approach. An approach that should be laced with a generous amount of humor. To some, the Boxer may appear as a "class clown" and in many ways they fit that description well. However, as in most cases, the class clown is simply testing the waters seeking to find his own confidence. A Boxer will do more for a smile than any other breed I have known. A heavy hand only leads to a heavy heart. A heavy heart can destroy the Boxer's spirit. Give Boxer plentiful doses of sunshine and fresh air. They enjoy a jog in the park or a swim in the lake. They are an "all around" dog and they can be as active or an inactive as you please. A Boxer can lounge on the couch with the best of the "couch potatoes." The secret is to include them. Being a part of the family is the Boxer's primary goal in life. If you do, you will have less trouble with the excavations in the back yard, or the flowerbed, the chewed furniture or shoes. Remember, a bored Boxer is a "busy" Boxer. Keep your Boxer "busy" in constructive endeavors and the destructive tendency will be better contained. Use a crate if you do have to leave the dog alone. They do enjoy periods of being left alone, as do we. The time spent safely in his/her crate is quickly forgotten when the dog sees you. Returning to an unblemished house brings a smile to your face and that's a perfect way to greet a Boxer. Don't consider the Boxer just a dog you would like as a pet. You will be making a new friend and a new family member. The fact that the Boxer is canine is irrelevant. We all know a lasting friendship, like fine wine, just grows better with time. The Boxer does not deal well with restriction, either in physical or emotional form. The most important thing you can spend on your Boxer is time. The profits you will receive are immeasurable. If you cannot spend the quality time necessary, spend your restricted time and money on another breed. Having a Boxer in your life results in boundless adventures. Hold tight to the lead and prepare for the journey of a lifetime. Boxers are a special breed and until a person has been a companion to such a dog, one cannot really understand the depth of their devotion. They are sincere in their preference for human companionship over the company of other animals. Unlike other breeds of dogs that can fend for themselves for the majority of the day, Boxers require our fellowship. They can exist in a household with other animals, but they prosper with human contact. This knowledge is key to living, and living well with a Boxer.